> Once we receive payment, we will have our art department start the design on your project or preflight your files to make sure they are print ready and prepare a proof. > We will send you a proof for review and approval. You can either OK the proof as is or indicate that changes are needed. > After we have received the final proof with your approval, we will send your order to print. Please call us or email us if you have any questions. 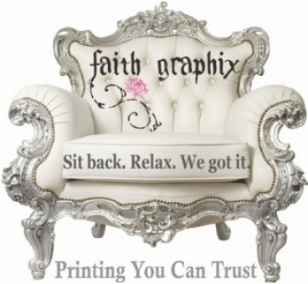 Faith Graphix-Printing You Can Trust at 262.997.4815 or info@faithgraphix.com.